Where do we begin? How about at the beginning! We have known you folks for over 10-years now from the very first time you represented us during the purchase of our starter vacation home on Pine Valley Road in South Lake Tahoe. How funny you both must have thought we were when we came to you on a Saturday after RV camping and said, “camping is not for us, we need a house NOW!”. Within one day you had shown us no fewer than 20-homes one of which we fell in love with and made an offer that same weekend. WOW, I cannot stress the awe and amazement we have for you and your wife and how quickly you worked to accommodate our need. As we know you are both aware, when the Farrow’s make up their mind that they want something, lightning moves too slowly! And yet you somehow knew that we were a family that moves and the speed of light and you easily stepped up to the challenge and helped guide us to an extremely smooth and amazingly quick purchase. We loved that house so much and when it was time to sell and upgrade not only did you represent us on the sale of the property but you were also able to help us realize a significant return on our investment. Who knew one could actually make a profit on the sale of a home! Next, we decided that we wanted to purchase an upgraded home in an upgraded neighborhood. Again when the Farrow’s move they move quickly. You both were able to advise and identify the perfect home in the perfect neighborhood. As a builder and general construction family, we were looking for a fixer upper in a neighborhood of higher priced homes. With no surprise to us, you folks found us the perfect fixer on High Meadow Trail in Montgomery Estates. This home needed some work and so you helped us to realize an affordable purchase price that to this day we still talk about. We have since turned this vacation home into a long term rental and are enjoying tenants who are helping us to pay down the mortgage and cover our debt service on the property, talk about a win-win. With property values as they are we have decide to keep the High Meadow as a long term rental for now and when the market recovers, we will without question have you list this home for us. With our High Meadow property rented to a full time tenant the dilemma of not having a vacation home in Tahoe weighed heavily on us, what to do? The only obvious answer was to contact the high power real estate team of Bosson & Bosson to find us a new luxury vacation home. Within a very short time we were in escrow on a fabulous home at a great value in a wonderful neighborhood through a short sale process. However, the story doesn’t end there, with your extensive experience in the real estate field, you recommend that we should keep looking, with the understanding that sometimes bank’s cant get deals done in a timely manner. With that said we put our fearless real estate team of Bosson and Bosson to work to find us other homes to look at while in escrow. Sure enough you guys located a home that was so incredible, in such a great location and so perfectly meet our needs that we decided to make an offer. The offer was accepted and we are embarrassed to say how incredible the deal was on this is new house! Escrow was opened and we closed on the new home within 60-days! What a story, we love this house so much that we are not sure we will ever want to move, but if we do, we know who to call. In closing, we cannot emphasize enough how incredible and amazing you two are. You both are the most competent and professional real estate agents we have ever worked with. You started off as our agents and have become our very dear and trusted friends. We will always and exclusively personally recommend you to anyone and everyone! Thanks again for the time and friendship over the years. 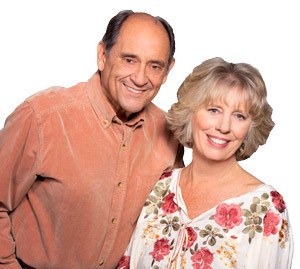 "Don and Jan Bosson were absolutely wonderful in helping us find our new home. As first time home-buyers, the process can be a little intimidating, to say... continued"